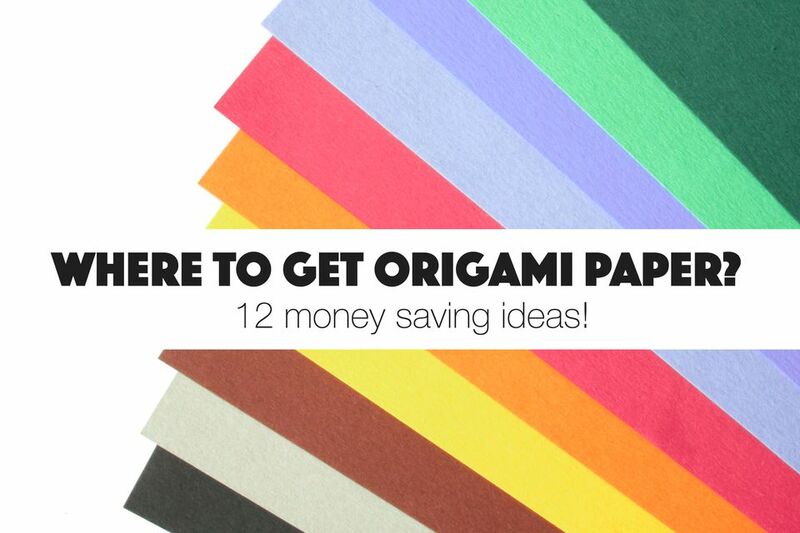 Where to get Free Origami Paper - Around Your House! If you can't get your hands on 'real' origami paper from shops near you or you can't buy online, there are plenty of places you can find suitable paper to fold with, you will probably have a number of these hanging around your house! People are always asking me where I get my origami paper from, and I never know what to say, I don't really like 'traditional' kami paper, which is thin, usually has a white side and makes a lot of crumpling noises when it's being folded. Lets face it, Chiyogami paper is SO expensive, I have some, but I'll probably never use it! I like to find origami paper in different places, a lot of the paper I use was not meant for origami folding, here are some of different types of paper I use. It might not occur to you that it's SO easy to make a square from a rectangular sheet of paper - How to make square paper, I love using this paper as its usually 21 x 21 cm which is such a nice size to work with. You might already have some printer paper or pads of coloured paper. Maps, comic books and other magazine paper can look really stylish and the textures range from harsh to glossy. You can even go online and print out some newsprint or Japanese kanji to make it look like you've used a magazine. The boxes in the image are available to buy from here. You might have some old books filled with music, these are often thin books with soft paper inside, if they belong to someone else, ask them first! Music sheets make beautiful origami paper, models made with this paper are often sold on Etsy and are very popular. Foreign language books / text books. I have a book that is some kind of Japanese learning book, I think to learn Japanese if you can speak Chinese, it has only Kanji written in the traditional top to bottom manner, the paper is wonderful quality, I bought it in a second hand store for about $10, you can also have a look in charity or goodwill shops, and of course, you can download and print out some Japanese text - there is some you can download for free here. I love to use wrapping paper to make origami, usually boxes as the colours can come off - especially if the finish is glossy. You can get large folded sheets of wrapping paper from local shops, big department shops or you might have some at home, the patterns you can get are amazing! You will need to cut it to squares which might be a bit tricky, if you have a large cutting board and knife this shouldn't be too difficult. The pink box is made from cute wrapping paper. Depending on the brand you use, this can make wonderful origami paper as it is a little bit see-through. The origami tessellation in the photo is made from baking paper! These two are similar, they both come in big rolls, are cheap and make the perfect paper for large origami projects or cut them down to smaller squares. If you bought some new shoes, save the tissue paper they are wrapped in, and if you buy a book, ask them to gift wrap it and save the paper! Tissue paper makes great origami lotus flowers in particular. I hope you enjoyed finding some ideas for origami paper, I'm sure you have found something that is available to you at home! A Useful Origami Paper Storage Pocket! Make a Cute Gift Box in a Pinch!